Pele's Hair: A cluster of Pele's Hair from Hawaii with a hand lens used for scale. Creative Commons photograph by Cm3826. Click to enlarge. The volcanoes of Hawaii produce many spectacular, dangerous and frightening sights. Sometimes they erupt lava fountains that spray incandescent lava hundreds of feet into the air. Sometimes they produce lava flows that cascade over a cliff into the ocean. 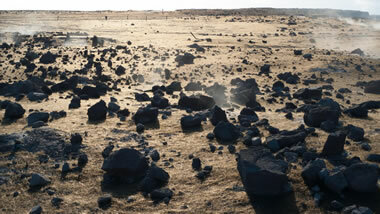 And, sometimes an especially vigorous eruption will spatter lava over the surrounding landscape. In each of the above situations, where molten lava flies through the air and when the conditions are right, strange eruption products are formed. Two of the most interesting are known as “Pele’s Hair” and “Pele’s Tears”. Both are named after the legendary Pele, the goddess of Hawaiian volcanoes. 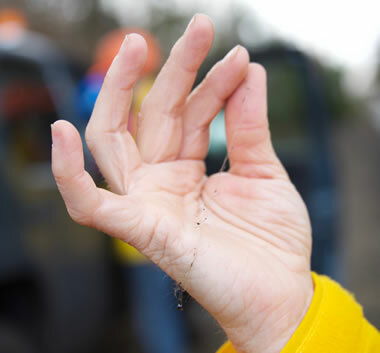 Very Fine Pele's Hair: Pele's hair can be so fine that it appears to have a thickness similar to a spider's web. 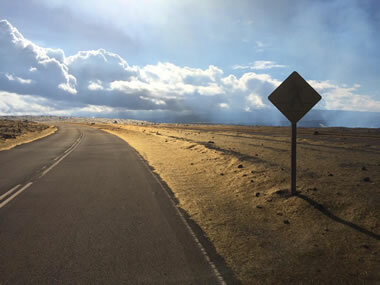 Photo from the 2018 Kilauea eruption by the United States Geological Survey. Click to enlarge. “Pele’s Hair” is the name given to hair-like strands of volcanic glass that are stretched from still-molten masses of lava as they are launched or fall through the air in a lava fountain, a lava cascade, or lava spatter. Pele’s hair can form as a flying globule of molten lava separates into two or more pieces and thin strands of lava stretch between the pieces after their separation. The strands solidify into glassy strands and accumulate downwind from their source. There the ground and vegetation can be covered with thin, lustrous, hair-like strands of glass. The strands are known to have been carried up to several kilometers from their source by the wind. Strands of Pele’s hair are very thin, almost always under ½ millimeter in width. They range in length from tiny broken pieces up to strands as long as 2 meters. Their appearance can be similar to coarse human hair with a golden-brown color. Geologically, Pele’s hair is a mineraloid formed from basaltic lava. 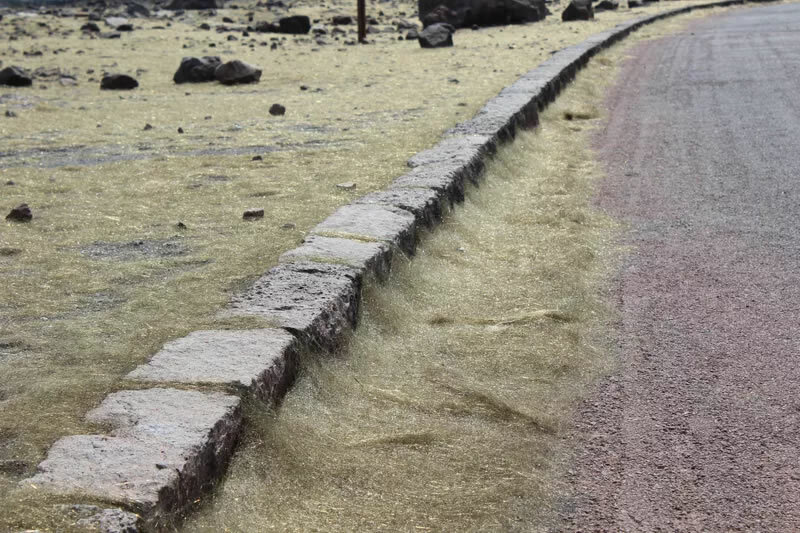 Pele's Hair Along Curb: Pele's hair is blown by the wind and usually accumulates in front of and behind obstacles to the wind. 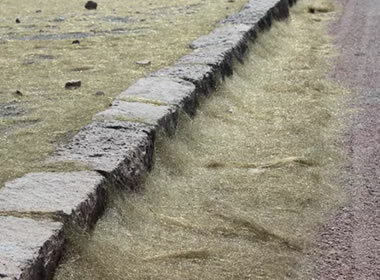 Here piles of Pele's hair have accumulated along a curb in a parking lot. This hair was fallout from a plume that rose from the Halema'uma'u crater. Photo by the United States Geological Survey. Click to enlarge. Treat Pele’s Hair With Caution! Pele’s hair should be considered a hazardous material. The thin strands of glass are very sharp, very brittle, and break easily. If handled they can penetrate human skin, break in the wound, and break again into even smaller pieces when extraction is attempted. In areas where Pele’s hair is forming, tiny sharp particles can be carried by the wind or remobilized when dust on the ground is disturbed. These tiny particles can cause severe eye injury. They tiny razor-sharp fragments can also cause respiratory injuries if inhaled. 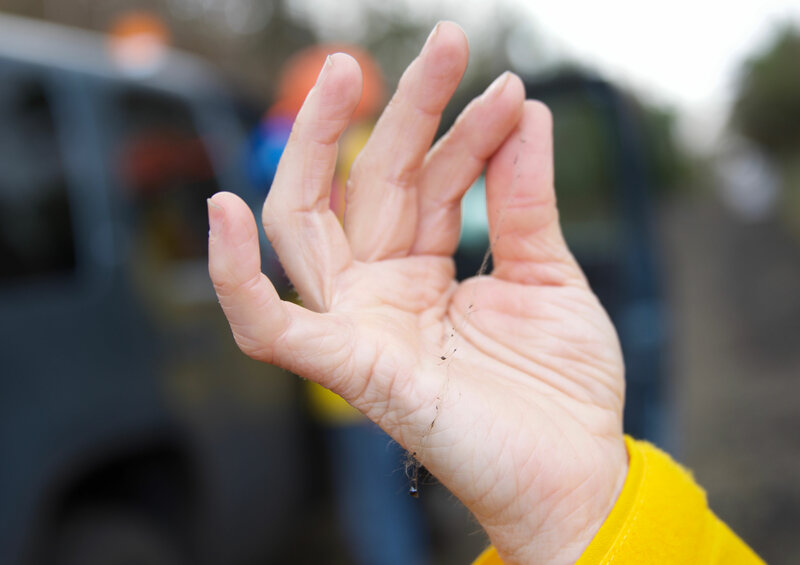 Stay away from areas where Pele’s hair is forming or areas where it has covered the ground. Pele's Tears: Numerous specimens of Pele's Tears. Creative Commons photograph by Ivtorov. Click to enlarge. A tiny teardrop-shaped globule of black volcanic glass similar to obsidian is sometimes attached to the end of a strand of Pele’s hair. 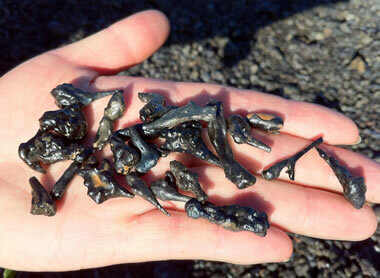 These usually break free from the hair and fall close to the vent that ejected the lava. These droplets of glass are known as Pele’s Tears. According to legend, people who remove rocks, shells, sand or other materials from the Hawaiian islands will be cursed with bad fortune by Pele. Many people who visit Hawaii are either unaware of this legend or decide to ignore it. Then, usually after they experience a tragic event, they learn of the legend or remember it and decide that their bad fortune was triggered by their theft. Then in remorse, they have an urgent desire to return what they have stolen to its rightful place. Pele's Hair blankets the ground between ejected basaltic blocks at Halema'uma'u Crater, Kilauea, Hawaii. The bright luster of the hair reflects the afternoon sun. Image by the Hawaiian Volcano Observatory, United States Geological Survey. Click to enlarge. 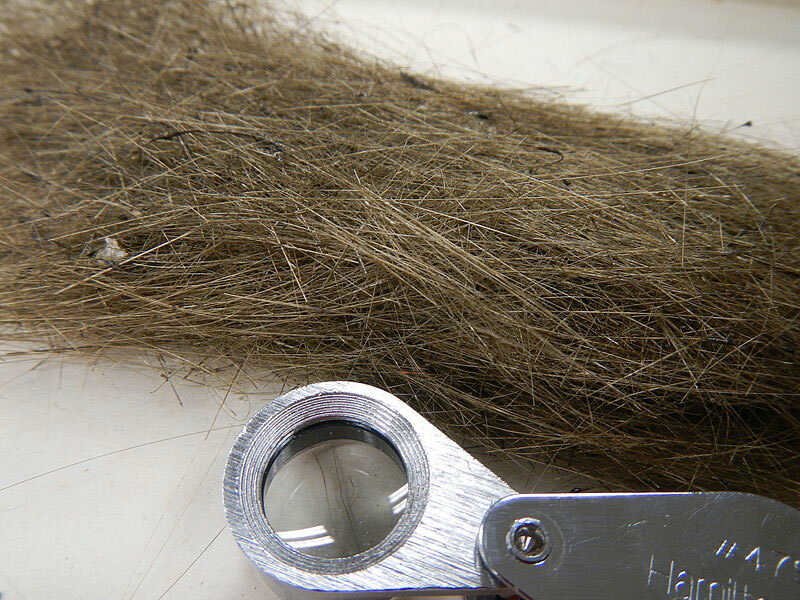 The formation of “Pele’s Hair” is not limited to Hawaii. It is found at Masaya Volcano in Nicaragua, Mount Etna in Italy, and Erta’ Ale Volcano in Ethiopia. In Iceland material similar to Pele’s Hair is called “Witches' Hair”. Lava “Thieves” Inundate Hawaii Volcanoes National Park With Mail: by Martin Merzer, Knight-Ridder/Tribune; an article published in the Chicago Tribune on May 6, 1992 and archived online. Accessed July 2018. Legal Aspects of Rock, Mineral, and Fossil Collecting: by Timothy J. Witt, J.D., website article on Geology.com, accessed July 2018. First scientific description of Pele's Hair by James D. Dana, published in: United States Exploring Expedition, during the years 1838, 1839, 1840, 1841, 1842, under the command of Charles Wilkes, U.S.N. ; George P. Putnam, Publisher; Geology, Volume 10, page 179. Pele's Hair lines the edges of Crater Rim Drive near the Halema'uma'u parking lot. The photo was taken looking towards the sun to show the golden luster of Pele's hair. Image by the United States Geological Survey. Click to enlarge.